The one piece you'll wear 24/7. Our new Hacci Jumpsuit features a deep scoop neck, cutaway racer back and cuffed ankles. Perfect for layering over your favorite bralette. Front pockets. It doesn't get any easier -- or any more timeless -- than this jumpsuit. 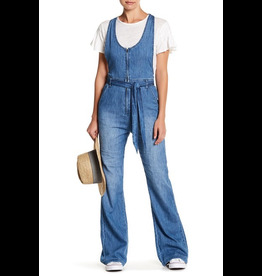 This one-piece wonder is made from denim for a classic look, and features utilitarian details like patch pockets and a spread collar for a workwear-inspired look.